Surely nobody watching Netflix’s celebrated drama The Crown ever thought to themselves “Gee, wouldn’t Claire Foy make a great pierced, tattooed computer hacker”? Perhaps that was the appeal for the talented actress, to play a role so completely against type. Switching out the role of Elizabeth (the 2nd) for Lisbeth (the 3rd) Claire Foy springs into action as the Girl With The Dragon Tattoo, who is also in The Spider’s Web, replacing Rooney Mara who replaced Noomi Rapace. There’s something not quite right about the casting of Foy, who fits a sovereign ruler perfectly in The Crown and an astronaut’s wife in First Man. As a lesbian computer hacker with a thirst for vengeance against evil men, Foy comes across ever so slightly like a Grandma. In a scene where her character Lisbeth Salander steals a luxury sports car, she drives as if she’s never been behind the wheel of a car before. Evading police on a motorcycle, it’s evident it’s not Foy under the helmet. And given the work of Tom Cruise as Ethan Hunt or Matt Damon as Jason Bourne or Daniel Craig as James Bond on two wheels on the big screen, it is basic character behaviours that fail to allow Foy to truly inhabit the troubled Salander. For my money, Atomic Blonde delivered a far superior feisty female action flick that was also fun to watch and Charlize Theron looked like she broke bones and lost blood in the process. 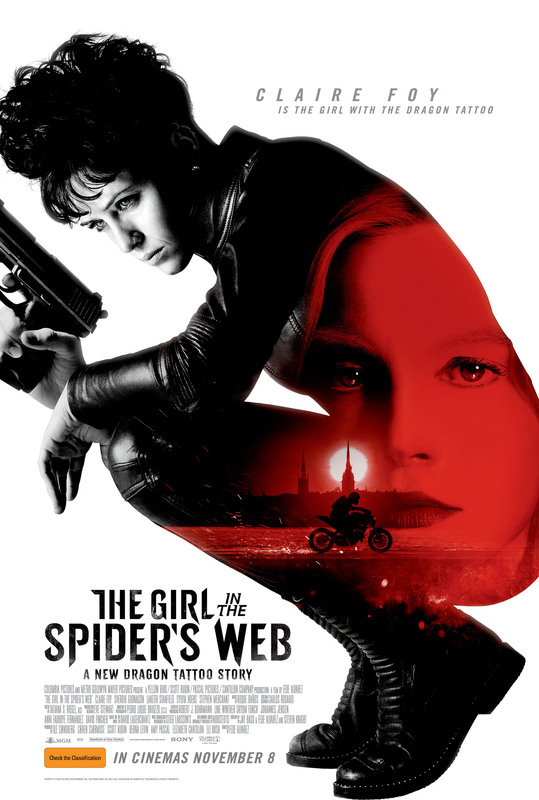 The Girl in The Spider’s Web is a terribly drab affair. It’s lit poorly, as if by fluorescent tube and candle, shot with no imagination, badly written, below averagely acted and edited like a student film, delivering a tedious two hours of tired story and uninspired action that I hated every second of. Watching the sensational female focused Widows from Steve McQueen one day later only confirmed my feeling that this entry in Stieg Larsson’s Millennium Series lacks any redeeming features whatsoever. Avoid at all costs. 1 Star.